It's a giveaway! - Chocolate Chocolate and More! Back when I started this blog, it was just me wanting to share my favorite recipes and document them for my family. I entered the foodie community and found so many wonderful new friends, all with the same passion for food. I’ve met people from all over the world through this blog. And I love it! No matter what our style, we all share the same love for food, cooking and sharing. And the holidays are coming, the season of giving! A few months ago, I contacted Iris at Mimi’s Needle and Thread. I’ve never met Iris in person but I met her on FB, and fell in love with her aprons. I love aprons, I counted the other day, and I own 24 of them. In my mud room, where most people would keep coats, I keep all my aprons. Some are half aprons, most are full. We all love to wear them. It puts us in the “mood” for cooking and baking. And they’ve come from everywhere. I love this one. It’s a child’s apron that I found at a yard sale years ago. In fact it’s so small, it’s too small for my girls now. So back to Iris, and her aprons. I sent her an e-mail, told her what I was looking for. She e-mailed back some fabric samples. The choices were all so wonderful, it was too hard to decide. So I let her decide. And this is what she did! It doesn’t come with the necklace or petticoat. But it does make me want to wear pearls when I’m baking! I’m in love with this apron! It may take a few weeks to arrive but that’s ok.
All you have to do is leave me a comment, any comment, here on this post. Be sure to include your e-mail address in the comment, so I can contact you when you win. You don’t have to like me on FB but I’d love it if you did. You don’t have to follow me here but don’t you want to anyway? You don’t have to share this but if you can’t win, wouldn’t you want a friend to? Just one entry per person allowed, on this post only. This giveaway will close December 8, 2011 at 11:59 pm EST and a random winner will be chosen using a good old big bowl full of numbers by my girls on December 10. So leave me a comment and your E-mail address so I can contact you when you win and thanks for joining me on this wonderful food adventure, Hugs! I was a little late doing the drawing but we now have a winner! You are fabulous. Do you know that? What a great, great thing to do. One question: Does the hottie wearing it in the pic on your FB page come with it? My mother would LOVE this…just have a fit! Wow. You’re so good. My fingers are crossed! Look for an e-mail Carrie and congrats! And thanks to everyone who entered. 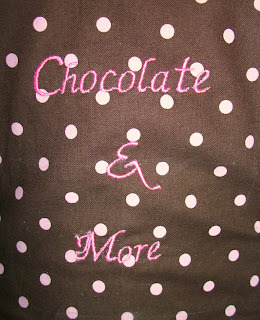 Oh, and I ordered 3 of these aprons which means there’s still one more out there..maybe Valentines would be a good time? I love that you have a collection of aprons. It reminds me of being in the kitchen as a kid. I’d love to win this one! Oh my I love aprons, I have ones that my Mom and sisters made me. Thanks for sharing !!! That apron is adorable. I definitely need a new one; I’m still using my old Starbucks apron. Yay! Is it weird that I search for cute aprons all the time, but I have yet to get one? Well here’s to hoping I win this one 😀 Thanks for the giveaway! I love the brown and pink together! This is an adorable apron. The detail makes it extra special. I too love aprons! My grandma took some from my great grandma’s and made them new again for me 🙂 Thanks for posting this at Church Supper! The apron is beautiful. I love your blog. I plan on doing a lot of chocolate treats for our Christmas festivities in December. Thanks for all of your posts. I already have a few in mind to try. Thanks for the chance to win. Good Luck everyone. That apron is amazing! My name is, Christen Eiland. I just recently started baking when I was pregnant with my daughter last year. I am now obsessed with it. My son loves to help in the kitchen…his version of helping is licking the spoons. Lol. Hope you have a wonderful Chrismas season! Thanks so much for all your helpful and entertaining blogs! The apron is adorable, I always say I’m going to get one, but never do. I’m a “new friend”, I look forward to a long friendship! I ABSOLUTELY love the apron; I want to purchase one even if I don’t win – how can I do that? Very cute! I would definitely love to win it! love reading your blog, and following your journey with your family. I think it’s so important to pass on cooking skills to our children, mine are adults now and both love to cook … my son does most of the cooking in their house and often rings with ideas or questions! My mother made aprons some and I have one of my grandmothers. They are fun and so is your blog. I’m enjoying your posts! What a great giveaway and such a beautiful apron! I wear one every day while cooking too. 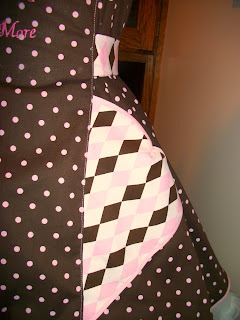 I love that you have a collection of aprons..
Just found your wonderful Blog! I would love the apron, but I never win anything/thanks anyway. We do white trash a little bit different. We put Golden Grahams or Chex cereal and peanuts mix these together, melted a bag of milk choc. morsels and poured over the cereal(also add raisins if you like them). Get a big paper grocery bag , after you have stirred the choc into the cereal mixture put into the bag and pour a box of powered sugar into the bag and shake. Discard left over sugar, its a choc. white sugar good tasting treat..Probably not as good as yours I’m gonna try yours. Thanks for the recipe.. 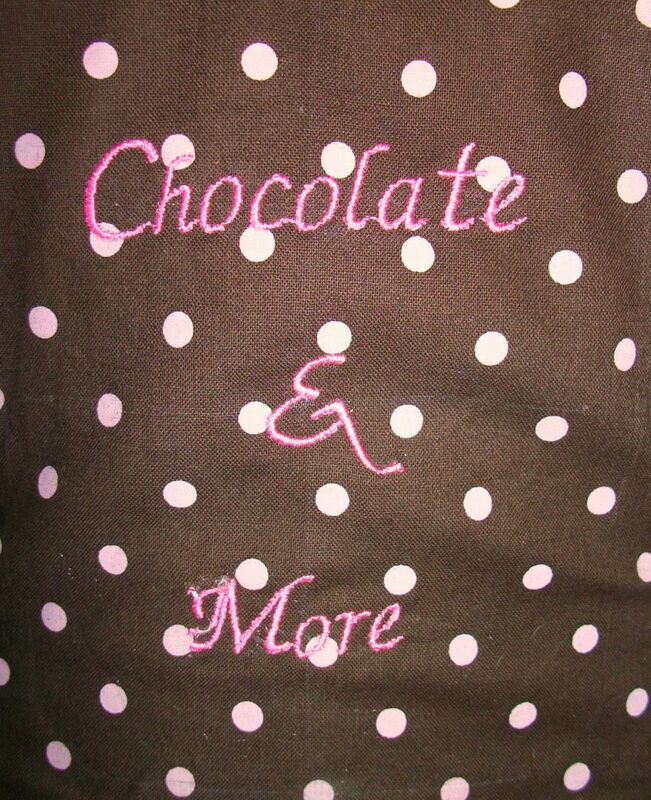 I ♥ Aprons. This one is adorable. Thanks for such a fun giveaway! Sexist apron on the planet! From one chocoholic to another: Awesome site you have going on here! I add a smidgen of chocolate to almost everything i make and let me tell you, it sure does add a little something extra special, doesnt it? Sort of like bacon…everything’s better with chocolate 😉 Even Bacon!!! Oh I just ordered from Iris!! I love this apron, and would love to add it to my collection! I am always wearing aprons! 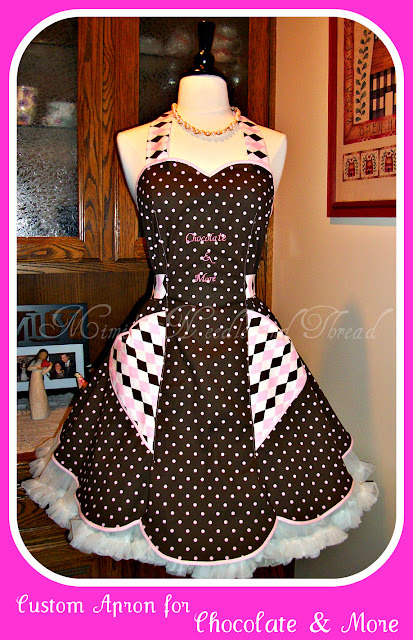 i would sooooooo look like Barbie cooking in that apron! and i wear aprons. old vintage ones. my kids probably don’t know what i really look like in the kitchen without one on, lol! OK, contest is now closed, any comments after this one won’t qualify, thank you all for entering, the girls will draw the winner tomorrow, good luck to all!